Unlike the Flamingo and Billy Wilkerson, the Desert Inn was a dream come to fruition for Wilbur Clark. Years of development, planning and construction made into a reality, even if everything didn’t go exactly to plan. As with many big dreamers, ambition can sometimes outlast finances, which was the case for Wilbur Clark and his Desert Inn. Moe Dalitz was a man with a dream as well, legitimacy. 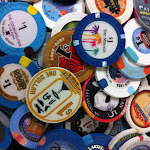 Las Vegas offered the opportunity to apply his gambling business acumen legally and in public. When his friend Meyer Lansky informed him of the financial problems the Desert Inn had encountered preventing the project from being completed, he jumped at the opportunity to invest. The deal between Wilbur and Moe gave majority ownership to Dalitz but kept Wilbur in place as a partner as well as the legitimate face of the property. It may be the first and only true partnership between organized crime owners and the legit front man. In most cases, the guy out front was little more than a bullied puppet with little to no input on operations. In the case of Wilbur and Moe, the Desert Inn partnership would go on to make them both very rich men.